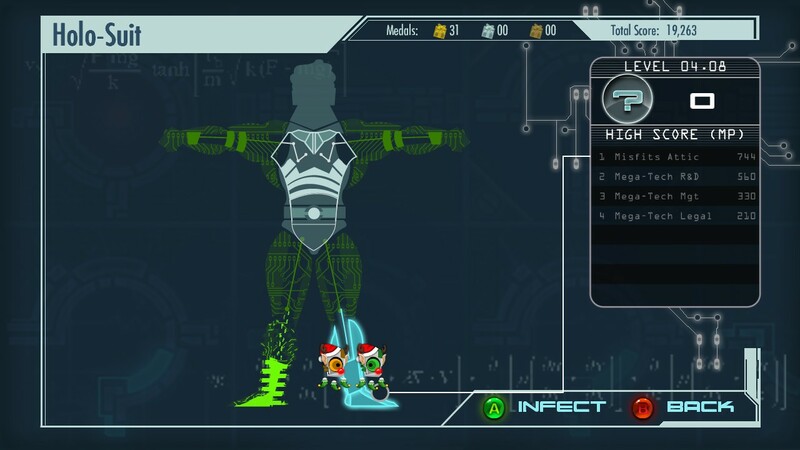 So, it’s a game about a virus, one named TOM apparently. Background check? Sure. So, Mr. Eccentric Scientist here goes about creating a city of the future for this company called Mega-Tech. Robot dogs, sidewalks that take you wherever you want, special tech suits that change your appearance….that kind of thing. Eventually, his eccentric side gets the best of him, and he ends up creating Globotron, a massive robot that “terminates” anyone who doesn’t use his inventions. Needless to say, he gets fired. “‘How is that even profitable’ they said”. So, as any “normal” Eccentric Scientist, he decides to take revenge on Mega-Tech. This is where you come in. You are TOM, a green funny looking virus created for the sole purpose of giving those idiots at Mega-Tech a lesson. So, how do we go about ruining everything? Easy. Get TOM inside those gadgets and have him turn those circuits into a mess. 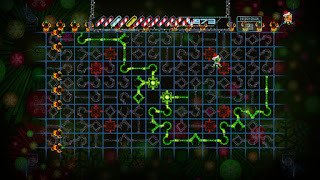 All you need to do is to spread the infection (green) to the whole circuit and you’re done! That easy? No. Ok, so the primary objective is to spread the infection to the entire circuit. To do this you have to rotate each piece in a way so that the infection reaches everywhere. The initial circuits are simple, but as you progress, things get difficult. Circuits keep getting bigger and more complex, enemies are added, your time limit (aka Energy) gets lower….in short, a whole bunch of stuff to make your life harder. Still, all these game mechanics are introduced in intervals over the campaign, giving you time to get used to each one of them. Each gadget is composed of various levels, and from some point up you will start getting Skips, which you can use to (obviously) skip levels. The level will be considered solved, and once you really DO solve it, you’ll get your skip back! 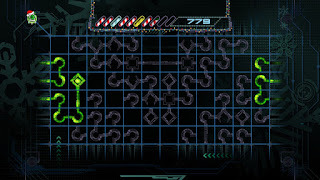 There is also a multiplayer campaign with even more complicated puzzles and an additional game element, this time a barrier, preventing players to cross over to the other player’s half of the puzzle. Some of these require two pieces to be rotated at the same time to succeed, so it takes a bit of practice. 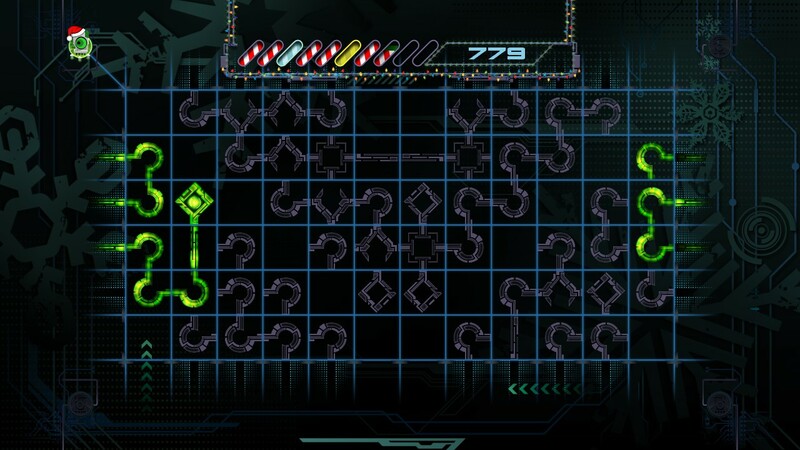 Additionally, there is a versus mode where you compete with up to 3 friends (the multiplayer campaign also supports up to 4 players) in a custom sized circuit where each player attempts to capture more squares than anyone else. 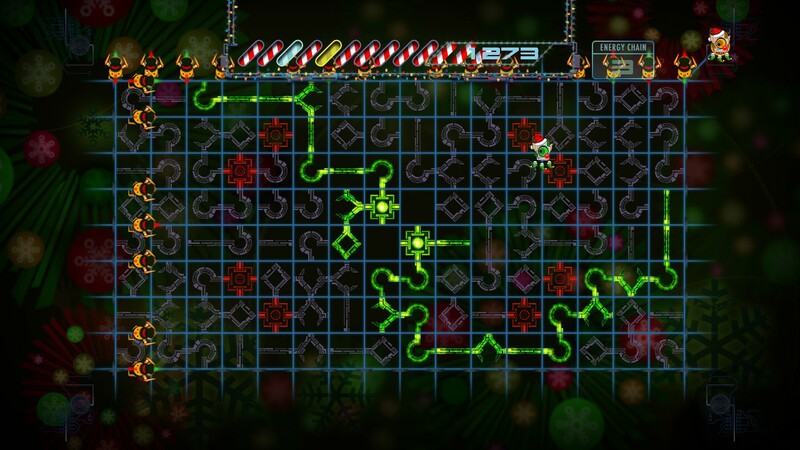 Of course, you can kill other players and get their squares, turning it into a random pool of death and robotic laughs. There’s also a tons of achievements, some of which pretty hard and global score leaderboards (via Steam). It’s such a shame that there’s no online multiplayer (yes, it’s local, so either you have a couple controllers or I surely hope your keyboard can have 10 keys pressed at the same time). So, in conclusion, if you like a good interactive kind of puzzle and want a good brain teaser, this might just be what you’re looking for. Difficulty gets pretty crazy further down the road. Even more so if you grab a couple of friends.